Kevin is a seasoned construction professional whose career includes hands-on field experience and extensive project management experience. Kevin oversees all phases of multi-family residential and commercial projects from design and development through closeout. He is an expert at inspecting and analyzing construction projects for viability and efficiency. His specialties include interfacing with developers, consulting teams, general contractors, local and federal authorities from pre-permit through completion, personnel acquisition, ongoing assessment and management. Kevin is known for being flexible and versatile. He is able to maintain a sense of humor under pressure, and is able to transcend team differences while guiding construction teams to their desired goals. 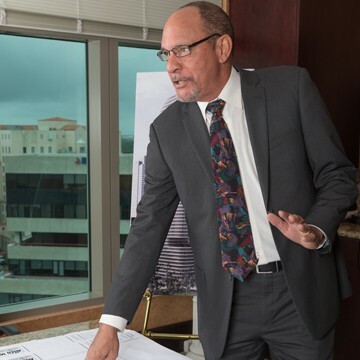 Prior to Allen Morris, Kevin oversaw all aspects of high-rise condominium construction as Project Executive on multiple projects for John Moriarty & Associates with total contract values in excess of $270 Million. His resume also includes positions of Project Manager with Turnberry Associates and Morse Diesel as well as Asst. VP Construction with Coscan Homes. Kevin is a Florida Certified General Contractor and has Accredited Claims Adjuster Certification from Miami-Dade College. Kevin was born in Washington, D.C. His family moved to Jamaica when he was 11-years old and he grew up in Port Antonio, Jamaica. He attended Howard University where he played soccer for the defending national champions. He has been married to his wife Grace since 1977. The couple has three daughters, Shannon, Tara and Aisha.